In addition to the Wukchumni Ceremonies held on the QOF, we have also held many Cultural Education Camps and Workshops.These events help support inter-generational and cross-cultural teaching and learning. They help us reconnect our partnership with nature and teach us how to utilize materials gathered from the land. For example, during our Acorn Processing Workshop, it was a cold and rainy day but we were able to host the activity in the barn. We built a wood fire and with all the bodies present, moving around as we worked, we were able to keep warm. Traditionally, we would have been working at the riverbanks! In 2015, the Quaker Earthcare Witness organization sponsored a series of four workshops to support inter-generational and cross-cultural teaching and learning. We made Clapsticks, a musical instrument, from the Elderberry trees. A Native Garden of local plants used for basketry and medicinal uses was planted. 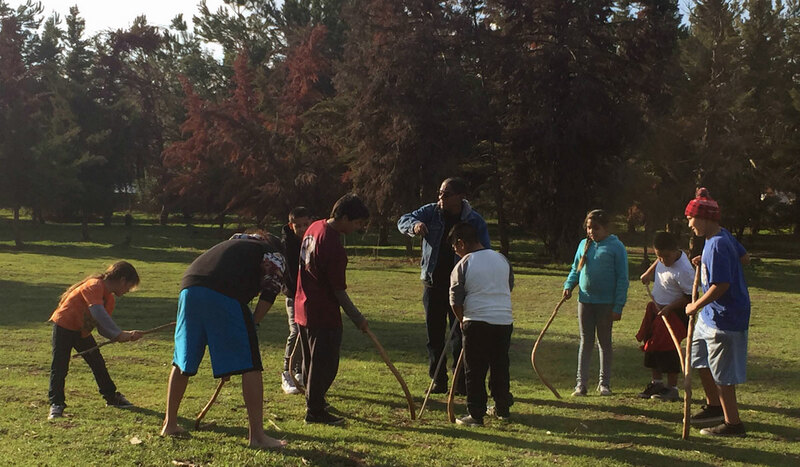 Games such as Stick Game (similar to Lacrosse), Hoop & Spear and Archery (for hunting skills), Hand Games, Walnut Dice Game, and Wukchumni Language games were enjoyed by over 30 participants. In January 2016, we held an Acorn Processing Workshop. Our friends from the Dunlap Mono Tribe were the main instructors: Julie Tex, Mandy Marine, and Carly Tex. They have a vast amount of cultural knowledge, and have always been willing to share. In addition, Julie holds a degree in Anthropology and Social Science, Mandy holds a degree in Archeology and Carly holds a degree in Linguistics. This workshop was sponsored through a project from Japan: The Small-Scale Economies Project at the Research Insittute for Humanity and Nature. The event was well attended and included 34 Adults and 13 Youth from Visalia, Fresno, Lemoore, and the coastal area. Tables were set up for Cracking & Cleaning, Grinding & Sifting, then Leaching and finally cooking. 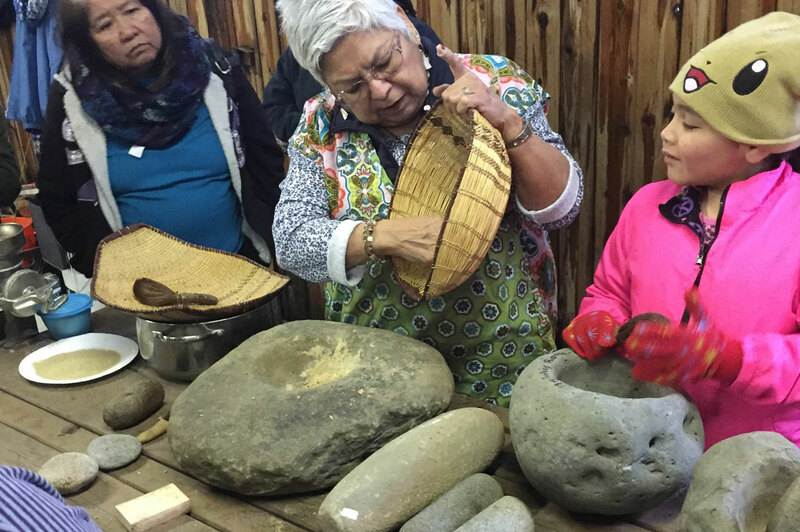 The presenters and my family brought traditional tools such as baskets, brushes, sifters & stirrers. They also demonstrated contemporary tools such as nutcrackers and grinders. The ladies from Japan were very interested in the work that we do, and were very happy to talk about local botany and get more information about our plants. As the acorn was leaching, the second presentation was given by our Japanese sponsors: Dr Junko Habu and Rika Shinkai. They talked about the acorn and buckeye of Japan. It was very interesting how similar our cultures are. Finally, we were able to cook the acorn. And when it was done, we were all able to taste it! The most important result of this workshop was that it has inspired our youth to process Acorns. At the 2017 Spring Youth Camp, three of our Wukchumni Pre-Teen Youth: Mariah Oliveira, Jackie Oliveira, and Lillian Weese – demonstrated and explained how to make Teh’Pin at Hospital Rock in the Sequoia National Park. Those pounding rocks had probably not been used in over a hundred years. I was so proud to witness this, and I know these young girls made our Ancestors happy.